Despite plenty of available habitat, food and nesting sites, peregrine falcons are not doing well in Lancashire’s uplands. The Forest of Bowland should be an ideal spot, but since 2011 there have only been a handful of successful nests – none of which have been on privately owned driven grouse moors. A scientific paper published that year, focused on Northern England including Bowland, concluded that breeding success was significantly lower around land managed for driven grouse shooting, and that illegal persecution was the main cause. As the RSPB’s Investigations team, we look to uncover incidents of raptor persecution, pass this to the police and offer support for any investigation. In April 2016, we installed a covert camera at a peregrine nest on a driven grouse moor in Bowland, Lancashire. This nest had a history of very poor productivity and had failed in unexplained circumstances in 2015 with two eggs found in the nest. This time, once again, when we returned 10 days later to check the nest site and camera, there was no sign of the parent birds and the nest contained four cold eggs. Clearly something tragic had happened in the interim. When we played back the footage, all became clear. On an evening in April 2016, the footage shows the incubating female peregrine fly off the nest. This is immediately followed by what sounds like four gunshots. The female bird is never seen again. A few minutes later, the footage then shows an individual in full camouflage making their way up the steep bank to the nest site. The person is present for five minutes and is seen hammering and attending to the ground at the nest site. As they leave they can be seen holding a hammer and what appears to be an orange handled item. It is believed that two metal spring traps were being illegally set on the nest ledge. Early the next morning, a male peregrine cautiously approaches the nest. Then follows the sickening moment when it triggers a spring trap set on the nest ledge. With its right leg now clamped in the jaws of the trap, the bird remains trapped for over ten hours. On numerous occasions it is seen desperately flapping and struggling as it attempts to escape. A second spring trap is also seen, which appears to be triggered by the bird thrashing about. Spring traps can only be legally used under cover to catch small mammals; their use in this manner is totally illegal and barbaric. Late that night, a figure returns with a torch and appears to put the bird into a bag. The male bird is never seen again. The identity of the person responsible remains unknown. The RSPB is grateful for the efforts of Lancashire Constabulary and the CPS in relation to this matter but ultimately it was not possible to establish who was responsible. Nothing can disguise the serious problem in Bowland with poor breeding productivity of peregrines, and also hen harriers. The circumstances clearly point to a background of illegal persecution. This situation is mirrored in large parts of the UK uplands. Raptor persecution may be listed as one of the UK Government’s wildlife crime priorities, but it is evident that the law as it stands simply cannot prevent a never-ending catalogue of crimes. As a result, raptors continue to do very badly in large areas of the UK uplands. 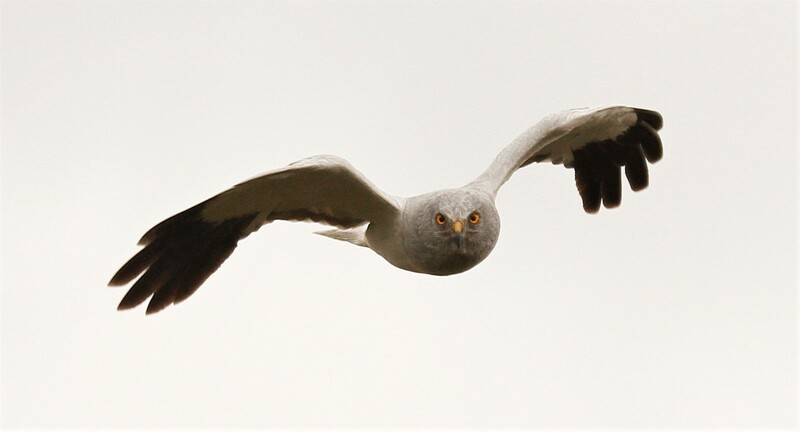 Last week Natural England released details of this year’s hen harrier breeding results in England with nine successful nests from 14 attempts producing 34 young. You can read our blog on this here. Whilst an encouraging improvement from 2016, we a still a very long way from the 300 pairs or more that England could potentially support. It was fascinating that several shooting organisations seemed to go slightly overboard in attaching themselves to this ‘success’ along with some rather exaggerated claims about the impact of the Defra Hen Harrier Action Plan. There were indeed four successful pairs on land which includes management for grouse shooting, though this land is managed by United Utilities and the National Trust. Despite vast swathes of habitat, there was not a single successful pair on a privately owned grouse moor. There are clear parallels with the problems faced by peregrines in Bowland and other upland areas managed for driven grouse shooting. The Government needs to do far more to create a climate of accountability, particularly on sporting estates. Whilst there has been some steady progress in Scotland, elsewhere far more needs to be done. The RSPB is calling on the UK Government to introduce a system of licensing for driven grouse shooting, to ensure land is managed legally and sustainably. Though the identity of the person in the video remains unknown, what is abundantly clear is that a crime has been committed, and that no one has been brought to justice for it. Whilst this is deeply disappointing, the RSPB will continue to do its utmost to stop wildlife crime and protect our threatened species.